Those of us who call the Lehigh Valley home spend a good portion of the year weighed down by our coats – and our fantasies of a tropical relocation that become a little more serious after each snow storm. Now that dreary forecasts are behind us, it’s time to hail our favorite spring hallmark: the sight of raised patio umbrellas and table-lined sidewalks. Ring in the season by dining alfresco at one of these local eateries. French, Asian and Mediterranean cuisine meld together in this Asian fusion eatery featuring dishes like the Grilled King Salmon (basmati rice, roasted yams, braised spinach, red pepper marmalade, soy garlic ginger vinaigrette) or Australian Lamb Chops (barley, parsnips, cipollinis, carrots, sherry marsala gastrique) with a covered back deck. You might not be able to swing a trip to Italy for dinner, but after a glass of wine and signature dish like the Bistecca (N.Y. Strip grilled over aromatic herbs, gorgonzola butter, baby spinach salad and marinated cannelloni beans) at a table on Sette Luna’s tree-shaded sidewalk, there’s a fair chance you won’t mind. 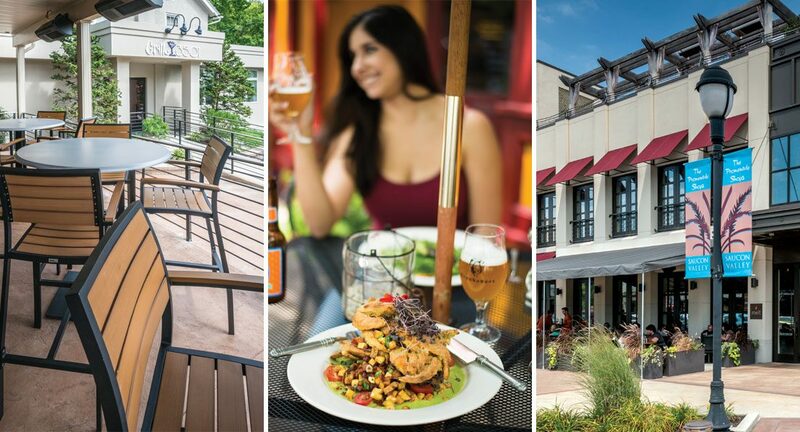 Start or finish a day of shopping at The Promenade Shops at Saucon Valley with a meal on Melt’s patio, which offers modern twists on traditional Italian fare like the Tonno (yellowfin tuna, roasted fennel, olives, sweet peppers, and orange and basil oil). Savor a taste of southern cuisine – a piece of cornbread with spicy tomato butter or the Duck Confit Po Boy (sesame romaine slaw, cilantro, pickled Asian pear, and charred red onion) come to mind, or sip on specialty cocktails like their Jalapeno Margarita (jalapeno-infused tequila, Grand Mariner, orange juice, and fresh lime) on The Bayou’s secluded patio. From Breaded Eggplant Parmigiana (served over linguini marinara) to a Creole Pasta Pot (crab, scallops, shrimp, and Andouille sausage stewed in tomatoes and creole spices) to beer-battered fish and chips, there’s something for everyone to enjoy on McCoole’s elegant patio. A carnivore and beer-lover’s delight: lounge around for an afternoon or evening next to the train tracks at an umbrellaed table with a pint of their rotating draft beers and one of their adventurous burgers (the Donut Delite boasts a 10 oz. beef patty, bacon, and Cooper sharp cheese on a crispy glazed donut; the Dirty Ratchet offers a 10 oz. sausage and beef patty, habanero jack cheese, an over easy egg, hash browns, and sweet peach compote on a brioche roll). Sit outside on a patio overlooking Broad Street at this bank-turned-gastropub while sampling their cheese platter, or branch out to one of their more experimental dishes like the Lobster Waffletta (butter-poached waffle salad, crispy waffle toast, and baby arugula). Gio’s casual, outdoor patio is a relaxing setting to enjoy a slice of specialty pizza (the Campania is piled with goat cheese, pear, extra virgin olive oil, and arugula) or one of their trademark pasta dishes. A roof-covered garden veranda creates a whimsical backyard deck dining experience at the Stone Bar Inn, where you can order from their extensive dinner grill menu or keep it casual with a choice from their pub menu. People-watch on Bethlehem’s Main Street at one of Tapas’ sidewalk tables while sampling a glass or three of their famous sangrias (which come in flavors like sparkling pear and blood orange berry) or snack on some of their small plates.